I have barely caught my breath from last year’s Summer Festival and here it comes again! But truly, not a moment too soon — we’re ready for warm summer breezes, and more than ready for hangin’ out with fellow Townies at Ingalls Mall. And this year’s Festival line-up has us chomping at the bit for the over-the-top fun that the Festival consistently delivers. Many thanks to… Robb Woulfe (Festival executive director) for his continued support and enthusiasm for my photography and for hosting PLAY.SPACE. Amy Nesbitt (and the rest of the Festival staff) for making all the stars align — not just with the exhibit, but with the entire Festival. Paragon Display Group, who are masterfully printing and mounting the exhibit pieces as I write this blog entry. Dianne Widzinski for her support and assistance at the Power Center. Max’s Festival line-up includes: Planet Rock, Detroit Fire Guild, Amococo, Strange Fruit, and the Tom Tom Crew (demo and show). It was so popular last year that I knew they’d be back. Planet Rock will be bringing its portable climbing wall to Top of the Park again this year! 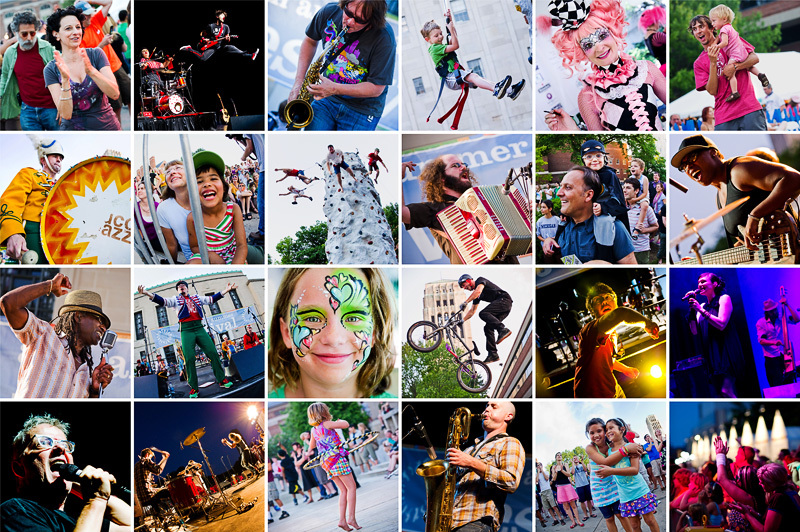 Ingalls Mall will be set ablaze by the Detroit Fire Guild’s eclectic brand of non-fire circus arts performances, including hoop dancing, juggling, stilt walking, and more. Amococo is neither a gas station, nor a chocolate liqueur. Rather, it’s “a walk-through inflatable sculpture featuring a dazzling maze of winding paths filled with radiant light and color.” It’ll perhaps be not altogether unlike FoolMoon — except, of course, we’ll be on the inside of the luminary! They’re back! They made such a powerful impression on 4-year-old Max when they were last in town that he’s been singing Dean Martin’s Kick in the Head ever since. Four out of five dentists recommend SupaFunkRock for their patients who chew gum.